Ready for brighter, smoother, more even-toned skin? 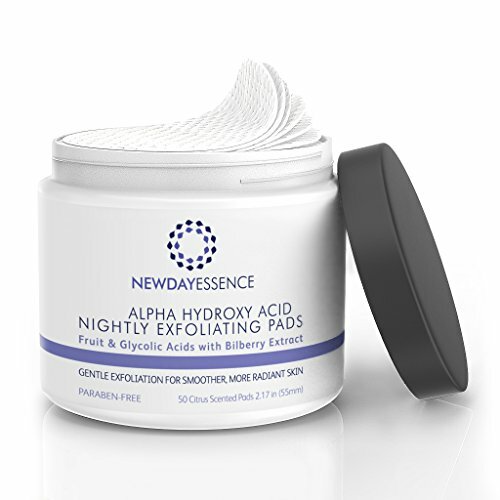 Our Alpha Hydroxy Acid (AHA) Mini-Peel Pads are pre-moistened with a synergistic blend of Glycolic Acid, Malic Acid, Lactic Acid and Organic Fruit Extracts, provide gentle yet effective exfoliation to slough off dead, roughness skin cells and promote cell turnover without drying out. With Organic Aloe Vera to naturally soothe and hydrate your skin. The easiest and most convenient way to get the radiant skin you want to see every morning. Made Naturally Without Parabens, Phthalates, Sulfates, Synthetic colors, Dyes and Fragrances. +Stimulate cell renewal and prepare the skin for nutrients and vitamins. +Unclog pores and minimize the pore size. +Even out and bright up skin tone. +Diminish the appearance of hyperpigmentation, age spots, discoloration scars, fine lines and wrinkles. Balanced for the skin's pH between 3.5 to 4.2. Can be used for Face, Neck, Decollete and Body. Ideal for Nightly Use and gentle for most skin types. If you’ve never used an AHA before, recommend start off using the pads once or twice a week, building up slowly to nightly application. NOTE: The Pads may not be suited for those with extra sensitive or rosacea skin due to AHAs. Proudly Manufactured in FDA-Registered Facility in USA and Cruelty-Free. If you have any questions about this product by Newday Essence, contact us by completing and submitting the form below. If you are looking for a specif part number, please include it with your message.